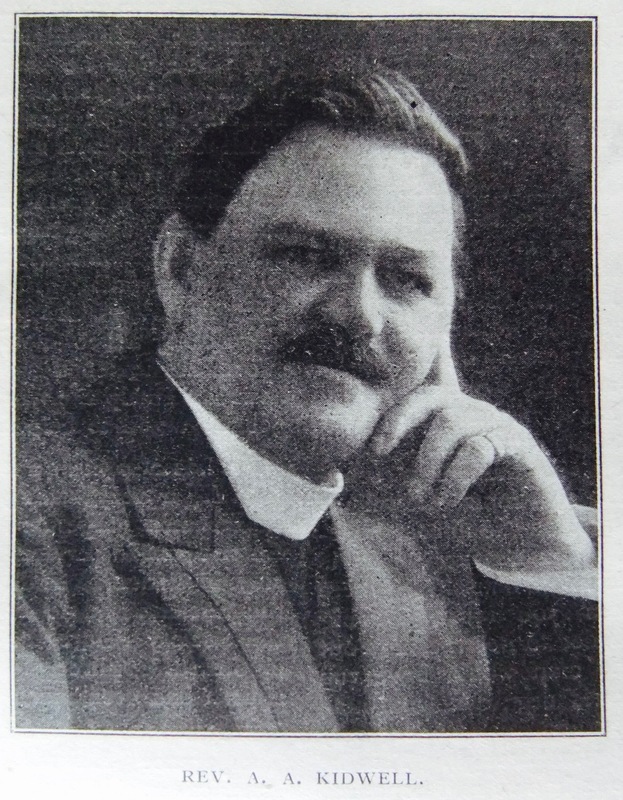 Transcription of Article in the Primitive Methodist Magazine by Arthur W. Hayes, O.B.E. He was not expressing his own opinion on either occasion; he was echoing what the majority thought and said. Ask anywhere in the Transvaal for the reason of this great change, and you will receive the same answer. It is owing to the energy, pluck, and determination of the Rev. A.A. Kidwell, the present Superintendent Minister. His ministry on the Rand is one of the greatest romances of Primitive Methodism. His success has been due to several causes. The foremost of these is that he was born in South Africa. This is a tremendous asset to any minister working in this great sub-continent, and means far more than we can estimate in this country. Then he can speak Dutch, or Afrikaans. This ought to be part of the equipment of every Missionary in South Africa. Add to these assets unquenchable energy, abundance of tact, marvellous patience, and extraordinary vision. He is a master of theory, but unlike the immortal Mr. Winkle, of Pickwick Papers, he has the gift of reducing it to practice. Then also in Mrs. and Miss Kidwell he has duplicates of himself so far as tact, energy, and Christian service are concerned. The work of these two ladies amongst the dusky women of Africa would provide a story of its own. Their sense of humour and their smiling Christian graces bring the light of gladness into heathen faces wherever they go. Their work is a human garden and every flower in it is separately and lovingly tended. Another contributing element of success is that he has learned to the full the great lesson that the work of a Christian minister is not confined to his own church and pulpit, but should be projected into the life of the community. This is where has scored his greatest success. The building of the charming little church at Jamestown, in Cape Province, The Kidwell Memorial, was a notable achievement. It was erected by the people in memory of his father, Mr. A.J. Kidwell, one of the pioneers of Empire. This exploit, and his work in Aliwal North, would have marked him out for distinction and his reputation is by no means local; it is in the truest sense national. We did not know Kidwell at his best until he tackled the almost hopeless problem of Johannesburg. It is questionable if he knew himself. There are men to whom you must give big things to do in order to get the best out of them. A little man would have run away from Johannesburg; a normal man would have stayed and gone under; only a big man could win through. This he did and to-day he is known and honoured in every part of the Union. All the ministers in South Africa to whom l spoke knew his name and praised his work. A very big work would need to be done in Sheffield or Nottingham for it to be talked about in Inverness, Cork, and Cardiff; yet the fame of the of Kidwell in Johannesburg has travelled many times those distances from Cape Town through the garden route and majestic mountains to Durban; from Durban through the illimitable veld to Kimberley; and from Kimberley to the “Land of Lions;’’ and with his name is linked that of Primitive Methodism. Three movements have given scope for his great abilities in community work – the 1820 Settlers, the Sons of England Society, and the Temperance Alliance. The honour most coveted by South Africans is to claim descent from the 1820 Settlers, those great and fearless pioneers of Empire. Kidwell can make this claim. For some time he was the backbone of this most progressive Society. His work not only brought him into close personal touch with the rank and file, but also with the great men of the Union. It gave his church a great lift when he was honoured by being made Secretary of that movement. His work was acknowledged by a substantial gift of money – every penny of which was given to church development; a very noble sacrifice. His efforts are impelled by two great ideas – how can I help the world, and how can I get the world to help my church. He has also been a leading light in the S.O.E., a very strong Society, binding Englishmen together in the pride of Empire and in service. It needs no long stay in Africa to realise the influence of this Society, and no long association with the Society before the name of Kidwellis heard. Through this Society his church has been much helped. He is also an ardent worker for the Temperance Alliance. He went to America at his own expense to study Prohibition, and the Temperance Movement in South Africa has been stirred into renewed activity by his enthusiasm. Johannesburg rang with praise; the leading papers devoting much space to reports, on the occasion of his debate with the great anti-Prohibitionist, Dr. Moll. This took place in one of the leading hotels. It was no mean achievement to enter the enemies’ territory and more than hold his own. These endeavours have had the effect he intended in raising the flag of his church to the very top of the pole, and giving Primitive Methodism a status in Johannesburg which maintains the great traditions of the past. With all these interests, he has always devoted himself to the primary work of a Missionary. After all that has been said about his Community work it remains that his greatest work has been done for the Natives. In South Africa he has established 7 Native churches with a staff of 62 Native preachers! He has formed 6 Native schools with a staff of 17 Native teachers and 851 scholars; and the Government grant has grown from £32 a year to £916. He is a Trojan for work himself, and has the greater genius of inspiring others to work. The principal Inspector of the Native Schools in the Transvaal (a Dutchman) told the writer that he was filled with admiration for the efficiency of his work. His study is a well fitted old stable in his back garden. I sat there one whole morning and listened to the tales of his visitors. At one moment I thought it was a lawyer’s office, at another a police court, then a Kaffir hut, and again a little Bethel. First a Dutchman comes, and the two are carrying on a conversation in Afrikaans; I don’t know what it is all about. I only know that the Dutchman looked worried when he came, but goes away smiling. Then an Englishman comes in bearing the traces of some great calamity. I retire while he pours into the Missionary’s ear his tale of sorrow. I meet him coming out, and a look of hope has succeeded his expression of despair. Now an old bearded Kaffir comes in with two Kaffir boys who want to marry his daughters, for so many head of cattle. One has a wife already who has proved unfaithful. He has been taught by Mr. Kidwell that the Christian law allows only one wife, and he is anxious to conform to Christian rites. They want his advice. The conversation is in Kaffir, and you wonder whether they are talking or choking; but when they leave, smiling their thanks, you know that they have left their load of difficulties in the stable study. The next moment he is rushing off in his car to a Native wedding in the Native church. A great occasion this, but space does not permit a description. We hurry back. A Native of another race is waiting. There is an ugly and revengeful look on his face. He is nursing a grievance against the white race because one of them has done him an injustice. He has gained the sympathy of a number of other Natives and is looking for the time when he can have his revenge on the white man. His plan is to organise his fellows so that on a given morning they will simultaneously put poison into the coffee they carry into thousands of white men’s bedrooms. He goes out with his white teeth showing in a broad smile, and I know that Christian grace has taken the place of his previous intention. I wonder if the city magnate, a short distance away, making his wealth out of the black man’s labour, realises how repeatedly the missionary is turning the poison meant for him into the rose leaves of faithful service. Primitive Methodism owes a great debt to the Kidwells, and the Mission field contains no more loyal workers. Never once did I hear a depressing word. Their whole service is a service of love; their whole lives a gospel of cheerfulness. Archibald Alexander Kidwell was born on 13 June 1876 at Jamestown, Albany District, Cape of Good Hope, South Africa. 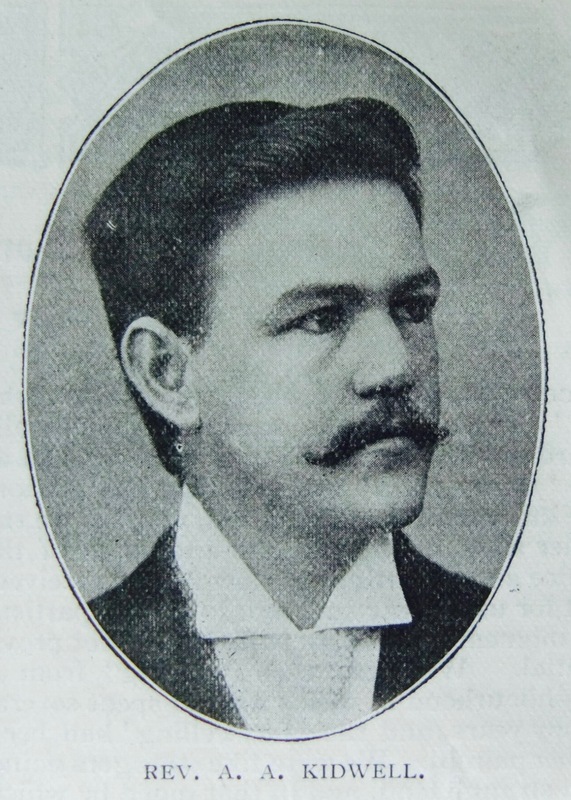 He was baptised on 2 December 1876 at Aliwal North, South Africa. His parents were Alexander James Kidwell, a general dealer, and Jane Willis Orchard. 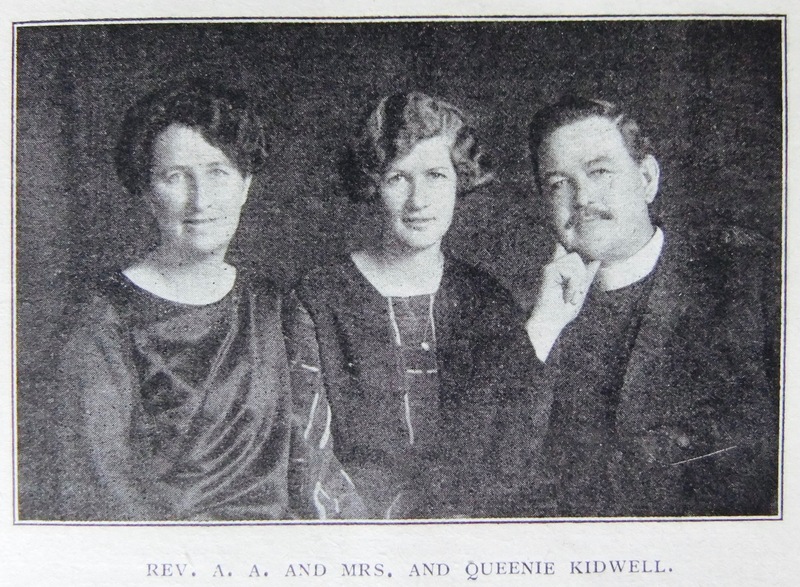 Archibald married Kate Hollidge (b1884) in late 1903 at Norwich, Norfolk. Census returns identify one of two children. Leary gives the date of his death as 25 January 1954; other sources on the internet report that he died on 15 April 1954 at Johannesburg, South Africa.